It was a night full of canny performances, but it's McGeady who stood out most to our readers and, predictably you had nothing but praise for the Irishman. It is becoming very, very clear that McGeady has considerably more quality than most other players in this league and, perhaps more importantly, seems to enjoy playing for us. First to celebrate each goal. Johnman - "Superb. If he could tackle back he would be Prem class!" Dale - "When’s he’s on [it] he’s our best player at this level, matchwinner"
Mr 6/10 outshone himself against Barnsley with a fantastic all-round midfield display. 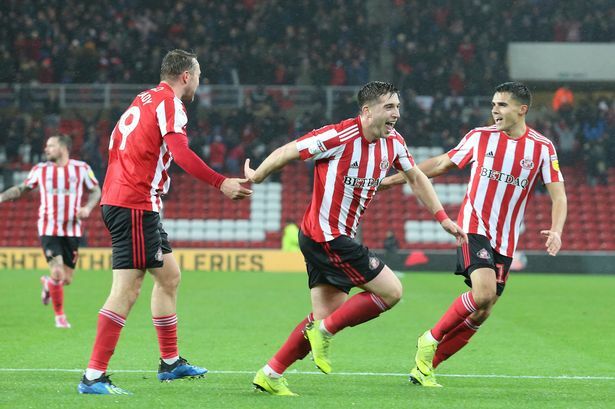 Like most of us, I've been quick to criticise the academy graduate but perhaps we're starting to see why Jack Ross trusted him with the armband, and maybe even evidence that he deserves it. Excellent performance. Frank - "Work so well a good solid perfomence." 62 - "Gets stronger every game, will only get better in my opinion." Has there been a more improved player under Jack Ross? After a woeful Sunderland career in season gone, Matthews began this campaign in similar fashion, unable to hold down his right back position against poor competition. Something clicked, and he went on to be nominated for the PFA Player of the Month in October, and continued to be excellent since. Anonymous - "My man of the match, excellent game, box to box, and [played a] brilliant ball into Maja for his goal"
Noggie - "Once I saw him as our weakest link, but he is no undropable. His pass to Maja was deffo Brazilian, outside [of the] right foot and weighted to perfection"
Interesting that three of the back four all earned the poorest score. It's not a surprise, given we conceded twice, though it should only have been once if Lynden Gooch took the easy option and cleared. Barnsley caused us a lot of problems, I think they did a canny job stopping them scoring more than they did. Johnman on James - "Stuck to a tough task"
Peter on Baldwin - "Again kept going against a very good Barnsley forward line"
Anonymous on Flanagan - "Difficult evening dealing with Moore but stuck to his task, good on the ball"
If you want to get involved in our new player comments feature, make sure you visit us shortly after each game to let us know exactly what you thought of the Lads' performance, and we'll feature a handful in these round up pieces. If you want to have you say on the last game, or read the rest of the comments, click here.